The Office Deli Refreshment Center can support 14 selections of entrees. 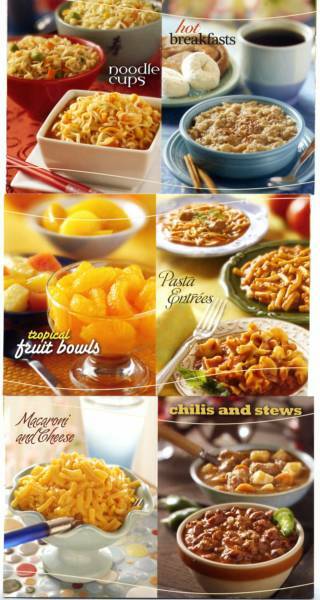 The entree module vends a wide variety of microwavable hot meals; soups, pasta cups, chili & stews, hot cereals, cold snack packs, fruit cups, and many other tasty heat-and-eat snacks and meals. You choose which entrees and heat-and-eat snacks that you desire. "We cater to your needs" We can vend most single serving microwavalbe meals, big soups, stews, tuna/chicken snack kits, fruit cups; just ask us. State recommended Healthy Choices are available. We are glad to provide products that conform to the standards put forth in the Government Guidelines. Let us know what your program calls for and we will be glad to comply. If you just want healthy products to choose from, just let us know what the products are. We encourage businesses to choose the products that go into the machines. "We Cater to Your Needs"